At the insistence of her grandmother, Kate Shugak reluctantly leaves the serenity of her Bush homestead for the wilds of downtown Anchorage, there to attend the annual Alaska Federation of Natives convention and discover, if she can before somebody kills her, the true circumstances surrounding the mysterious death of one of their Native association board members. There are so many things I love about this book. I love the whole moose scene, especially when Kate nearly loses her jeans in front of Ekaterina. I lovelovelove the Nordstrom scene, and that Mutt doesn’t recognize her afterward. I love Kate’s speech at the convention, a tub-thumping, bell-ringer of a rabble rouser. But my heart truly belongs to Calm Water’s Daughter and The Woman Who Keeps the Tides. Those Greeks are all alike, party party party. 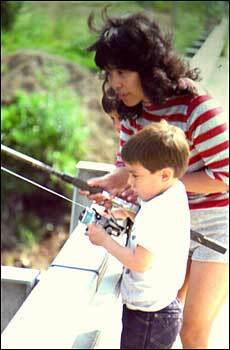 Kathy doing two of her favorite things, fishing, and being a mom. Kath and I grew up together in Seldovia. She is my oldest and dearest friend. Back in the early days of my career, when came one rejection too many, Kath took me down the road to the Double Musky, poured half a bottle of Gran Marnier in me and on the way home we stopped off at the Indian Creek campground and had a sacrificial bonfire of all my rejection letters and rejected manuscripts. Must have worked, because almost immediately thereafter I was accepted at Hedgebrook Farm, and five months after I got home from Hedgebrook I sold my first book. I always said if I had a daughter I’d name her Katherine Joan, for Kath and my mother. Ekaterina is Russian for Katherine, and Ivana is Russian for Joan. Kate definitely bristled, and Jack was delivered from instant and total annihilation only by the approach of a sales clerk, female, lots of teeth, all on display, lots of blonde hair, ditto, lots of height, wearing a pin-striped suit over a cream silk shirt with a gold bar pin at the collar and discreet gold studs in her earlobes. “Are we finding everything all right?” She smiled kindly upon Kate. It wasn’t the “we,” it wasn’t even the kindly smile. Kate disliked being towered over by anyone, and in that moment she discovered that she especially disliked being towered over by blondes who looked like they would fit nicely into anything tailormade for Marilyn Monroe. Unaccountably, Jack did not appear to share in this dislike, and greeted the salesclerk with an expression that was barely half a drool away from outright salivation. “We were looking for some clothes for the lady,” he said. “Five feet one,” Kate lied. “I don’t wear dresses,” Kate stated. One impeccably penciled eyebrow raised ever so slightly. “Tuxedo pants it is then,” Alana said with missing a beat. “This way.” She wove her way through the racks and around a shopper scrutinizing the inside seam of something covered in gold sequins that Kate tried not to look at too closely. “We can hem them for you,” Alana said. This time the triumph reached Kate’s eyes. “I need them by seven o’clock tonight,” she said gently.